At the Monaco Yacht Show, yacht designer Luca Dini presented a new Cantieri di Pisa Akhir 42S concept. When presenting the design at a press conference, Dini pointed out four design touches that show how he has strived to carry the design DNA of Cantieri di Pisa into the new yacht. 1. 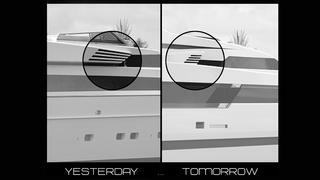 The Cantieri di Pisa bow The image above shows the hull of the previous Akhir design alongside the new 42S concept. As you can see, the hull shape is very similar. Luca Dini has preserved the bow angle seen on the original, while updating the design. The new hull shape is less curved and sportier, but the shared design philosophy is apparent. At the Monaco Yacht Show, yacht designer Luca Dini presented a new Cantieri di Pisa Akhir 42S concept. When presenting the design at a press conference, Dini pointed out four design touches that show how he has strived to carry the design DNA of Cantieri di Pisa into the new yacht. 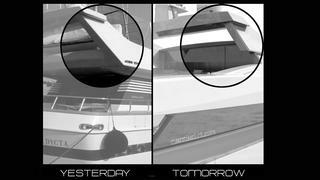 The image above shows the hull of the previous Akhir design alongside the new 42S concept. As you can see, the hull shape is very similar. Luca Dini has preserved the bow angle seen on the original, while updating the design. The new hull shape is less curved and sportier, but the shared design philosophy is apparent. The renderings above show how the original air intake has been carried forward on the new design. With four angled slots, the new air intake is a subtle yet less chunky version of the older design, but gives an obvious nod to its predecessor. The window design on the new Akhir 42S also shows off the Cantieri di Pisa heritage. On both yachts the air intake gives way to a pilothouse window. Both also have a long swath of glazing on the superstructure, though the new version has lower bulwarks, affording great views while in the main saloon. The renderings above show how the original air intake has been carried forward on the new design. With four angled slots, the new air intake is a subtle yet less chunky version of the older design, but gives an obvious nod to its predecessor. The window design on the new Akhir 42S also shows off the Cantieri di Pisa heritage. On both yachts the air intake gives way to a pilothouse window. Both also have a long swath of glazing on the superstructure, though the new version has lower bulwarks, affording great views while in the main saloon. 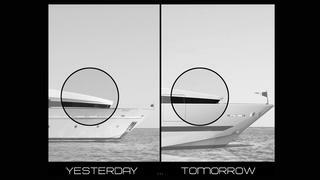 The superstructure of both of these Cantieri di Pisa yachts looks similar, despite being drawn decades apart. In his mission to retain the design DNA of the earlier Akhir yachts, Luca Dini’s inspiration is clear with each yacht's cabin roof sloping gently forward. Of course, there are details that differ – for example, in the new rendering you can see where the balcony is concealed. In a modern advancement beyond its predecessor, the new Akhir 42S concept features balconies on either side of the owner’s cabin set forward on the main deck. The superstructure of both of these Cantieri di Pisa yachts looks similar, despite being drawn decades apart. In his mission to retain the design DNA of the earlier Akhir yachts, Luca Dini’s inspiration is clear with each yacht's cabin roof sloping gently forward. Of course, there are details that differ – for example, in the new rendering you can see where the balcony is concealed. In a modern advancement beyond its predecessor, the new Akhir 42S concept features balconies on either side of the owner’s cabin set forward on the main deck. The radar arch is a fantastic example of how the design DNA of Cantieri di Pisa has been retained whilst completely brought up to date at the same time. 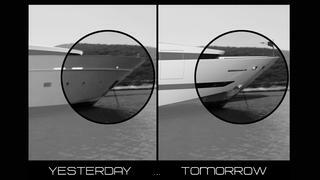 In previous Akhir yachts, the radar arch was located on the back of the flybridge. The new concept has moved the it towards the centreline, while still staying true to the philosophy of the original shape.